Fox Lodge is a Victorian 2-storey end-terraced house, situated on the northern side of Wirksworth, ideal for exploring the peak District National Park, yet convenient for local facilities. A lovely, light house with well proportioned rooms for a family holiday. The cottage sleeps 4 + 2 on the sofa-bed in the living room. Fox Lodge is well equipped and comfortably furnished. 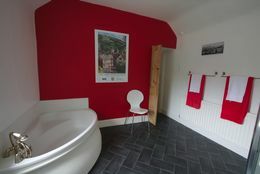 The cottage has 2 double bedrooms, a large bathroom , a through lounge/dining room with a double sofa bed for additional guests and a new kitchen has recently been fitted. We can also offer a travel cot, high chair and booster seat for our younger guests, and safety gate at the foot of the stairs. A further safety gate can be fitted to the understairs storage area to create a dog pen. Fox Lodge is available all year round and we accept short break and mid-week to mid-week bookings as well as weekly bookings commencing Saturday. We are happy to accept up to 2 well behaved to dogs at Fox Lodge. Please read our doggy etiquette guidelines before booking. 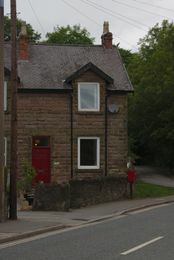 Wirksworth sits at the head of the Ecclesbourne Valley 5 miles south of Matlock. 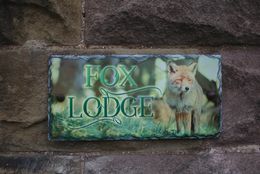 Fox Lodge is within easy reach of good local facilities. The nearest pub is about 200m away, with a Co-operative store a further 100m beyond. Other shops include butchers, delicatessen, mini supermarkets and takeaways all within easy walking distance. There is also a local park with play facilities including skate park for children within 200m of the house, not to mention the network of public footpaths from Wirksworth into the surrounding countryside. Although the house itself does not have wi-fi, a few minutes walk to the town centre will find free wi-fi at The Red Lion, Le Mistral and the local library. The hall gives access to the kitchen and the lounge/dining room, and stairs leading to the first floor. There is some hanging space in the hall and a large walk-in area under the stairs where you will find chairs for outside, the hoover etc. and space to store walking boots and bicycles. This area can also be fitted with a safety gate to create a dog pen overnight. 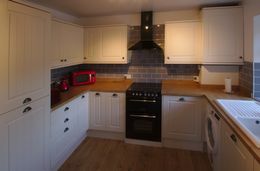 The ground floor has laminate flooring throughout. The Living room is a large room created by knocking two rooms into one. 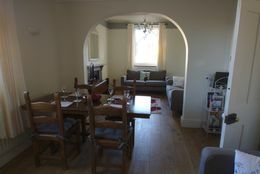 It is divided into zones with a seating area centred around the open fire, having two 3-seater sofas, occasional table and the Freeview TV with DVD player. The dining area has a large wooden table seating 6, and there is a secondary seating area at the far end of the room providing a quiet area. The sofa at this end of the room opens out into a compact double bed (4'5" x 5'11"). You will find a selection of books and games for all ages and a selection of tourist information around this room. The Kitchen is spacious, and new. It has plenty of working space and a separate breakfast bar where onlookers can sit and chat to the cook without getting in the way!! The 4 ring hob and fan oven are electric, and there is also a fridge/freezer, a dishwasher, microwave oven and a washer/dryer. We provide plenty of crockery and cookware including some less breakable plastic crockery for little people. 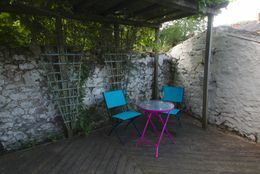 The back door opens off the kitchen giving access to the rear courtyard which includes a decking area, partly shaded by a vine covered pergola. A table and chairs are provided. The yard is gated with a tall wrought iron gate. Bedroom 1 has a wooden framed king size bed. A chest of drawers sit either side of the bed with lamps, and a vintage wardrobe provides hanging space plus more drawer and shelf space, with a 2nd chest of drawers for further storage. 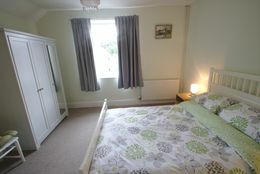 Bedroom 2 is another double room with a standard double bed. A bedside chest and lamps sit either side and there is a 3 door wardrobe and large dressing table. There is ample space for the travel cot in both bedrooms (bedding not supplied). The bathroom is large, with a large shower cubicle, corner bath, wash basin and wc. Although Fox Lodge does not have any parking of it's own it sits right next door to a small public car park which is free and unrestricted. 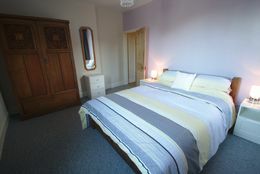 For guests using only 1 double bedroom we offer a 5% discount.